Click here for a copyDeviceAtlas recently released a new edition of its quarterly Mobile Web Report based on web traffic during Q4 2015. The new issue reveals various trends on the most popular operating systems, device vendors, device models with the main focus being comparison of Android and iOS web traffic throughout the whole of 2015. Is your country dominated by Android or iOS? While Android devices generally sell better than iPhones, there are many countries where web traffic generated by iOS devices is significant. The latest DeviceAtlas report helps you understand whether your local market is dominated by iOS or Android. We noticed that during the whole of 2015, Android was the leading mobile OS in most countries, but the amount of web traffic generated by iOS grew faster. Four countries in 2015 switched from Android to iOS and only one country switched from iOS to Android. 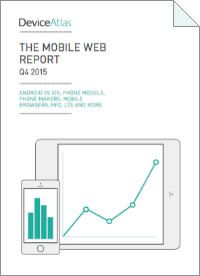 The Mobile Web Report for Q4 2015 also covers the most popular Samsung Galaxy phones, most used mobile browsers, stats on device release years, NFC and LTE capabilities, and more. Click here to get your copy of the report. Local Time: Friday, April 19, 2019 04:02 AM PDT – Page Load: 0.4789 Sec.